2019 has arrived! It’s a new year with new opportunities to not just learn English, but to live it! If you are like most people, you spent the end of December reflecting on how the past year went. You thought about the lessons you learned, the relationships that you developed, the opportunities that you had, the progress you’ve made, and how you can become the best version of yourself in the upcoming year. You may have even taken a break from practicing English during this holiday season in order to celebrate the progress you made with your English skills over the course of the year and to spend time with your family and friends. I hope that you spent some time to treat1 yourself during the Holidays as well. You deserve it! However, now is the time to get back in the game and start taking the steps to make the new year an EPIC one. It’s time to continue your journey to English fluency, and ride the momentum2that you built last year into 2019. Around this time of year it’s common to focus on creating resolutions or goals that you want to achieve for the new year. Although I think goal-setting3 can be useful to understand the direction you want to go in throughout the year, it’s more important to focus on your habits. I like to imagine goals as the destination you want to reach along your journey. If your goals are the destination, then your habits form the map that allows you reach your destination. Instead of just focusing on your English goals for this year, start to focus on building the habits that will help you achieve your long-term goals as an English learner. Consistent daily habits and routines in English can be formed easily with the right strategy. In this article, I’ll break down4 five simple habits that will completely transform your journey to English fluency this year. Whether you are just getting started with learning English or have been studying the language for a while, meditation is a very beneficial practice to add to your day. Along with helping you grow as an English learner, it has numerous benefits that will help you perform better at your job and be more present in your relationships with your family, friends, and loved ones. Research shows that a daily meditation practice improves your mental capacity, enhances focus, relieves stress, and cures depression. If you also do them while being guided by an English speaker, you can improve your listening skills and expose yourself to new vocabulary by immersing yourself in the language. It is a win-win5 opportunity for you. Not only will you improve your overall health and well-being, but you will also become a better English speaker. If you want to make meditation a consistent daily habit, then you want to make it as easy as possible when you first get started. Make it simple. Don’t try to complicate things. Before or after an existing part of your morning routine, such as eating breakfast, start creating this habit by scheduling five minutes to just focus on taking deep breaths and relaxing before you go to work. Science shows that it’s easier to create new habits if you stack6 them with your existing habits and make them easy to perform. You can use YouTube videos or you can find apps that can guide you through the process and help you keep track of your results. Insight Timer is a good app to get started. It has thousands of guided meditations in English, as well as other languages. Make sure to join the “RealLife English Meditators” group when you download the app. Learn more about the benefits of meditation throughout the process of learning English. I’m a big believer that music is the key to mastering your speaking skills in any language. It is an important part of my daily routine. When I sing in Portuguese in the morning, I feel more positive because the music usually puts me in a good mood. Also, it’s the perfect moment to practice the language by trying to imitate my favorite singers. Singing along to your favorite songs is a fun way to improve your pronunciation, intonation, as well as your rhythm and flow in English. Also, it teaches you a lot of slang expressions and gives a lot of insight into the culture that the song comes from. One way to significantly improve your English fluency is by creating a habit of singing every day. You can make singing in English a part of your routine by doing it while you take a shower, get dressed, make breakfast, and commute7 to and from work. These are just a few examples of how you can start practicing your English while doing other routine tasks. Singing during your existing routine tasks makes it frictionless8, which helps make this new habit last for a long time. If you would like to use music to take your English to the next level, you can even do it in a more deliberate9 way. In the video below, RealLife Fluency Coach Ethan explains a very useful, effective way to learn English with songs. You’ve probably heard this a million times, but this is an awesome way to learn. TV series and movies are so effective because it makes the learning process a fun, real, and permanent part of who we are. While this is so obvious to those who have learned this way (even if they can’t explain it), it does not occur to most people to use their favorite TV shows or movies as a learning tool. With Netflix, today there are a variety of shows and movies to choose from, all at the tip of your fingertips. Although you need more time to finish a movie, you can easily schedule 30 minutes a day to create the habit of watching an episode of your favorite TV show in English, after work when you are eating dinner, or before bed. The series “Friends” is a great option. Honestly, there seems to be a correlation between people who LOVE friends and high levels of fluency. Friends not only represents a whole generation, but people all over the world still love watching it. Also, the characters are all likeable, it’s hilarious, a great gauge10 for American Culture, and there are 10 seasons (236 total episodes)! The American author, Julia Cameron, has a journaling exercise called “Morning Pages,” that has become widely known for its ability to help people improve their writing skills and how they feel every day. The Morning Pages exercise starts when you wake up and are getting ready for the day. She explains that you can start the day off strong by writing three pages in your journal. If three pages sounds intimidating11, try to write one page to start and work your way up to12 three pages. The purpose of this exercise is to practice writing down all your thoughts, both positive and negative, in order to clear your mind and help you think in English,instead of your native language, when you wake up. Writing down negative thoughts and feelings allows you to leave the negativity on the page instead of carrying it around with you and spreading it to other people. Go the extra step and type your Morning Pages on the computer, and then use an app such as Grammarly to get feedback on your writing mistakes. After you edit and make corrections to your writing, share your favorite parts with a friend or English coach, and ask them to give you feedback on ways that you could improve. You could even use your Morning Pages to start writing articles for a blog and see how your audience responds to each article that you post. If you take about 15 to 30 minutes a day to write in English, you will soon see major improvements in your writing ability. Creating a daily writing practice such as the Morning Pages will help you take the vocabulary and grammar that you learn and use it in a practical way that will help you improve your self-awareness13 every day. One of the easiest ways you can improve your English skills this year is by creating the habit of listening to podcasts on your commute to and from work every day. They can help you refine14 your listening skills and learn new vocabulary in English. They are also a great opportunity to dive deeper15 into questions you are curious about exploring. First, choose a podcast episode that you find interesting and want to use to practice for the week. Once you choose a podcast episode, try to listen to it the first time at normal speed, without taking notes. Afterwards, go back and listen to it again. If it was too fast the first time, trying slowing down the audio speed and taking notes. After listening to the podcast the second time, try to write a summary of what you heard . Finally, listen to the podcast at normal speed again and check to see if your summary makes sense. If you find it interesting, and are feeling brave, feel free to share the summary with a supportive community of friends that are also learning English, or with your English coach. You can use the podcast episode that you listened to in order to spark16 a new conversation. Are you ready for an EPIC year? Hopefully your year is already off to an amazing start. The habits that you are able to form as an English learner will impact your ability to reach the goals that you set for yourself. Instead of trying to create big, complicated English goals or habits that will be hard to accomplish and maintain this year, focus on creating small habits that are fun, natural, and convenient. Over time the benefits of those habits will compound17, and you will see a huge difference in your ability to speak and understand English. The habits you form today will allow you to live your English and become the best version of yourself in 2019 and for the years to come. 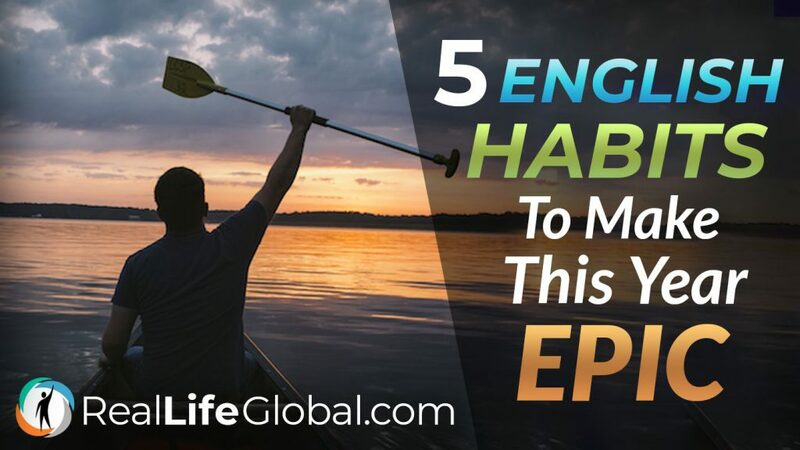 Make this year your best year ever by making a commitment to yourself to create habits that will help you achieve success and grow as an English learner. Are you ready to answer the call to adventure and start your journey to English fluency in 2019? Download a FREE copy of the RealLife English Manifesto and get our best English tips! Awesome! No doubt you will achieve your goal Agnieszka! Keep making progress every day. Thank you for this great article! Unfortunately, I couldn’t find the podcast “Oprah Winfrey’s Super Soul Sunday”. but these are great tips. I’ll try to make a new habits to improve my English. Thanks Shino! I appreciate your comments and I hope my tips help you out. I love to read your articles. I not only learn english butI take some awesome tips. Thank you so so much for such amazing work. I will tell you how it works with me your tips. Thanks for reading my articles Myriam! Keep me in touch. I want to hear about your progress. Thanks Anne! I’m really happy my tips have helped you! I’m a big believer that creating the habit of learning English can transform your students’ lives. RealLife is always on English learners side! Thanks a lot Zach for your helpful tips. Hoping to put them into practice over the new year. I’ll keep you informed at the end of it ?